January 1, 2019 is the effective date for more than 200 new Illinois laws. The Senate Democrats recently published their list of new and interesting laws that take effect in 2019. Among the measures that go into effect Jan. 1, are laws regarding car seats, carnivals, cats and more. On January 1,2019, 253 new laws will be added to Illinois’ list of statutes. These new regulations are reflective of the efforts of the 100th General Assembly, which met during the Land of Lincoln’s bicentennial year. During the two-year-long 100th General Assembly, 9,646 pieces of legislation have been filed. 5,998 items originated in the 118-member Illinois House, and 3,648 started in the 59-member Senate. Of the items originating in the House of Representatives, 834 bills passed the chamber. For bills starting in the Illinois Senate, 867 initiatives were approved and forwarded to the House. 1,268 pieces of legislation passed both houses of the Illinois General Assembly. 1,044 bills were approved by the Governor. 135 initiatives were vetoed by the Governor. 50 vetoed items were overridden by lawmakers, rejecting the Governor’s objections. 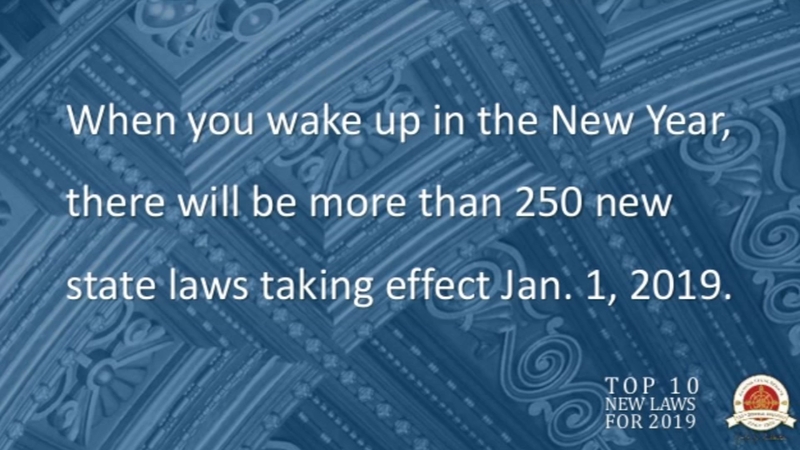 The effective date of new laws can vary. Some legislation designates that the new regulations begin immediately upon becoming law. In other cases, legislation is date-specific, including the start of a new fiscal year or calendar year. Among the 253 new laws taking effect on January 1, 2019, here are 10 new initiatives added to Illinois’ law books.